Officiant: We are gathered here today in the sight of God to celebrate one of life's greatest moments - The Joining of Two Hearts. In this ceremony today we will witness the joining of GROOM/BRIDE and GROOM/BRIDE in marriage. If there is anyone present who has just ‘cause why this couple should not be united let them speak now or forever hold their peace. Father of the GROOM/BRIDE : I do. Officiant: Today we have come together to witness the joining of these two lives. For them, out of the routine of ordinary life, the extraordinary has happened. They met each other, fell in love and are finalizing it with their wedding today. Romance is fun, but true love is something far more and it is their desire to love each other for life and that is what we are celebrating here today. It is remembering to say “I love you" at least once a day. Officiant: The love that GROOM/BRIDE and GROOM/BRIDE feel for one another is a seed that their parents planted in their hearts years ago - and today it has blossomed. Today, as they embrace each other in their love, they also embrace the families, which have come together on this happy occasion. As a sign of their love for their families, GROOM/BRIDE and GROOM/BRIDE would like to offer these roses, to their mothers as symbols of their eternal love.These Roses are a promise that no matter how far away you are - that you are not forgotten and that you are always in their hearts. Officiant: I Corinthians 13:1-8 Love is patient; love is kind; love is not envious or boastful or arrogant or rude. It does not insist on its own way; it is not irritable or resentful; it does not rejoice in wrong doing, but rejoices in the truth. It bears all things, believes all things, hopes all things, endures all things. Love never ends. Officiant: GROOM/BRIDE and GROOM/BRIDE, I invite SPONSOR and SPONSOR to place a cord over you. This cord symbolizes an infinite bond of love you share that keeps your relationship strong in the face of adversity, as well as that you both are no longer two, but one in marriage. May this cord remind you to face your life together courageously and to be mutual in support of each other in carrying out your duties and responsibilities as a couple. And, may your love grow stronger and bind you closer together through the years. Officiant: Now let us do an exchange of the Arras, or coins. Instruction: SPONSOR will present the pillow with the coins to the Officiant. Originally, there was an understanding of husband as "bread winner" and wife as "home maker" so the coins were given and received not in a spirit of reciprocity but in a give/take relationship. Nowadays the coins are a reminder of good stewardship for all couples; that they will mutually support each other, their children and the world around them. May God bless these coins that symbolize mutual support and responsibility. Officiant/GROOM/BRIDE: Instruction: The officiant drops the coins into GROOM’s/BRIDE's waiting hands. GROOM/BRIDE then drops the coins into GROOM/BRIDE hands. GROOM/BRIDE then puts his/her hand above GROOM’s/BRIDE's then drops the coins back into his/her hands. Finally, GROOM/BRIDE gives the coins to Tuan (Best Man) for safe-keeping. Officiant leads and GROOM/BRIDE repeats after him/her. GROOM/BRIDE: I accept them and in the same way pledge my dedication to you, the care of our home, and the welfare of our children. Officiant: I would like to call on the secondary sponsors to remove the cord and veil. Officiant: GROOM/BRIDE, do you take GROOM/BRIDE to be your Husband/Wife? Officiant: Do you promise to love, honor, cherish and protect him/her, forsaking all others and holding only unto him/her forevermore? 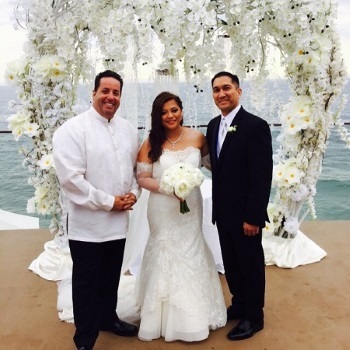 Officiant: GROOM/BRIDE do you take GROOM/BRIDE to be your Husband/Wife? Officiant: Instruction: (Best Man) will hand the rings to the Officiant. Lord, bless and consecrate this GROOM/BRIDE and GROOM/BRIDE in their love for each other. May these rings be a symbol of their true faith in each other, and always remind them of their love. I GROOM/BRIDE, take you, GROOM/BRIDE to be my Husband/Wife - To have and to hold, in sickness and in health, for richer or for poorer, in joy and sorrow, and I promise My love to you. And with this ring, I take you as my Husband/Wife, for as long as we both shall live. Officiant/BRIDE/GROOM Instruction: Alan leads and GROOM/BRIDE follows: I GROOM/BRIDE, take thee GROOM/BRIDE, to be my Husband/Wife. To have and to hold, in sickness and in health, for richer or for poorer, in joy and sorrow, and I promise My love to you. And with this ring, I take you as my husband/wife, for as long as we both shall live.”. Officiant: GROOM/BRIDE, please face GROOM/BRIDE, and hold his/her hands palms up. These are the hands of your best friend, young and strong and vibrant with love, that is holding yours on your wedding day, as he/she promises to love you all the days of his life. These are the hands that will comfort you when you are sick, or console you when you are grieving. God bless these hands you see before you today. May they always be held by one another. Give them the strength to hold on during the storms of stress and the dark of disillusionment. Keep them tender and gentle as they nurture each other in their wondrous love. Help these hands to continue building a relationship, rich in caring, and devoted in reaching for your perfection. May GROOM/BRIDE and GROOM/BRIDE see their four hands as healer, protector, shelter and guide. Officiant: Today you have decided to share the rest of your lives with each other. This beautiful union is now symbolized by the lighting of the Unity Candle. The candle you are about to light is a candle of Marriage. The individual candles represent all that you are and all that you have been until this moment. It is a candle of Unity because both candles must come together to create the new light. Its fire is miraculous because it represents the light of two people in love. This candle is also a candle of Commitment because it takes two people working together to keep it ablaze. Love is like a flame; it has the heat of passion, it is constantly changing, its radiance is there for all to see and together you must protect it from being extinguished. GROOM/BRIDE and GROOM/BRIDE please light the center candle to symbolize the union of your lives. Officiant: Today, as you have lit this candle, may the brightness of the flame shine throughout your lives together. May the twinkle of this one light be a testimony of your union. May this candle burn brightly as a symbol of your love and commitment to each other. The life that each of you experienced now, individually, will hereafter be united, for the two shall become one. Officiant: Bless their marriage, O God, as they begin their journey down the road of life together. But most of all, dear God, help them to keep lit the torch of love' that they now share so that by their loving example they may pass on the light of love to their children and to their children's children forever. To make your relationship work it will take love. This is the core of your marriage and why you are here today. You may kiss your GROOM/BRIDE .